sixteen - depending on how much I shiver at that exact point. So, for the time being, I give up. I choose instead, since the cold isn't messing with my vision, to merely take in as many details as possible of this new Tiguan, the second-generation of which has appeared ages after the car first went into production back in 2007. 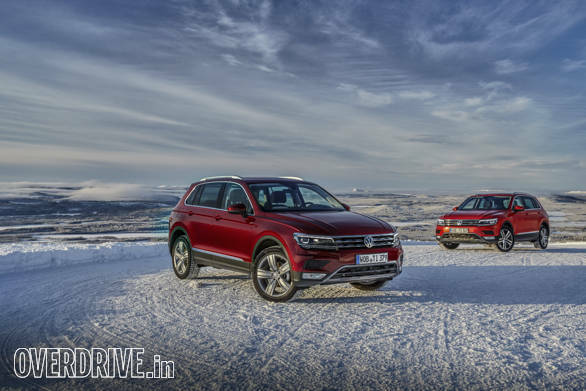 And given the fact that it's been nearly a decade since the first-generation Tiguan came out, it's a rather drastic difference between the ageing progenitor and all-new offspring. 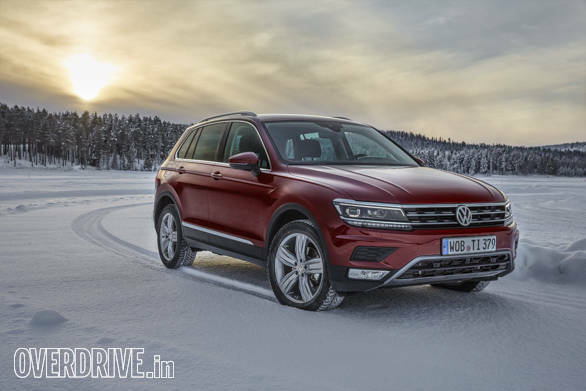 To begin with, the 2016 Tiguan appears to have lost the 'crossover' tag of the earlier model, with the emphasis being that the new car is an entirely ability-driven SUV. It certainly looks more imposing, partly down to the fact that it's bigger. The car is now 60mm longer, and 30mm wider than the earlier model, with a wheelbase that's gone up by 77mm, while the height has been reduced by 33mm when compared to the previous model. This, combined with the fact that the car also features a wider grille, which merges into the headlights seamlessly, gives it a more aggressive look. 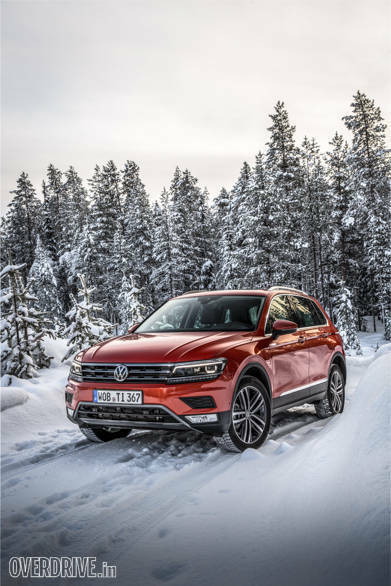 It looks a little more like the purposeful, all-terrain-conquering SUV that Volkswagen intends it to be, and less like a Soccer Mom's runabout, of which the old Tiguan was redolent. Viewed head on, the exterior of the Tiguan is helped immensely by those parallel 'character lines' that form a 'V' shape on the now higher bonnet. The key design feature of the car, according to designer Marco Pavone, is the high shoulder line. It does give the car something of a butch appearance, and it's a nice touch that the door handles find themselves neatly nestled in this very line that runs along the side of the car, before finally merging into the tail lamps. The lights at the rear are also reminiscent of the Golf R and the new Passat, with the sharp design helping tone down the bulk a little. Save for the badging, there's no difference between the petrol and the diesel versions of the Tiguan, although we must say that we preferred the fiery orange shade that the TSI we drove came in, as compared to the wild cherry red on the TDI. Stepping into the cabin of the Tiguan is a pleasant experience for two reasons. The first, I'm finally out of the icy clutches of the cold Arctic air. The second is that the interior of the car is a very nice place to be. The cabin is roomy and feels practical and premium all at once, and if you've driven the new Golf or Passat, might seem rather familiar. The base version Trendline TDI that we drove, had black and grey interiors that were simple but well-finished. However, the Highline trim that the TSI we drove came in, with black leather interiors, seemed particularly luxurious. We'd say it's quite on par with slightly more upmarket competitors. There's ample legroom and headroom up front, with plenty of space for absolutely anything that you might need to stow away. Since the Tiguan is a five-seater, you'd expect things to be a little cramped, perhaps on the rear bench, which isn't the case. There's enough legroom at the rear, even if the driver up front happens to be six-foot tall. And the person sitting in the middle isn't likely to be squished either, because the car really is a proper five-seater, with ample space for three abreast. Of course, the middle passenger will need to contend with the fact that the AC console at the rear robs him of a few inches of kneeroom though. Head room also appears to be enough, with only extremely tall passengers likely to complain if they are in the middle seat of a variant with a panoramic sunroof, which eats up a little space up top. And if what you'd like is to go on a camping trip, you should know that the luggage space has expanded by 145 litres over the previous car, to 615 litres. If you happen to fold the rear seats down, then you manage to get 1,655 litres of space, which makes things even better. There's also a coupe version in the pipeline for Europe, while a long wheelbase version of the Tiguan, with more space on offer, will be available in North America and China in 2017. India, however, will get the five-seater in 2017, as confirmed by Volkswagen at the Auto Expo. Of course, given that the all-new Tiguan is the first SUV from Volkswagen to be based on the MQB platform, it's hard to escape the platform's influence even inside the cabin. A glimpse of it can be seen in the optional 12.3-inch digital instrument panel that's on offer, similar to the one in the new Passat. This Active Info Display is a handy option too, for tucked away between the two dials is all the navigational information you can possibly need and it saves you the trouble of looking at the display unit positioned in the centre of the dashboard. Another optional add-on is the head-up display unit, which in the case of the Tiguan, isn't integrated into the windscreen itself, but comes as a little independent plastic screen that almost appears sticker-like on the glass  it stands out, and makes the car feel just a little less well-finished. The other nifty little touch that you'll find tucked away in the cabin is the 'interface box' that allows you to plop in your smartphone and charge it right there without any cables. In fact, the Tiguan comes pretty heavily loaded with tech and connectivity options such as Volkswagen's MirrorLink, Apple CarPlay and Android Auto, all of which help connect your smartphone to the intuitive information display unit to make life simpler for you. 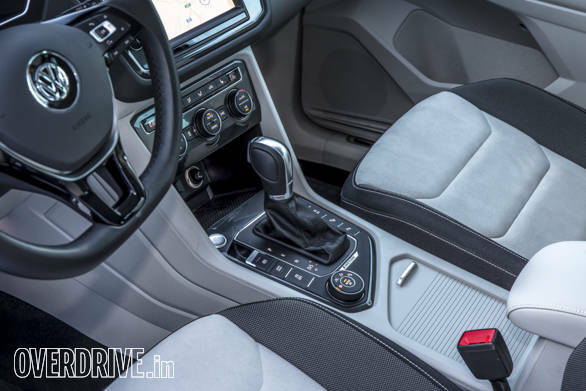 But Volkswagen's piece de resistance is the very handy rotary control knob placed right below the gearshift that allows you to toggle between driving modes to get the most out of the Tiguan. 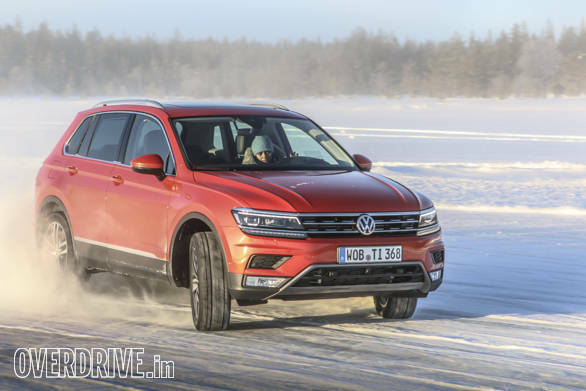 According to Jurgen Pützschler, head of chassis development for the new Tiguan, they were determined to make swapping between driving modes easy, which is why instead of having to navigate through the infotainment system before being able to change things, they now allow you the comfort of just turning a knob - Snow, Normal, Off Road and Personal. And with that little bit of information registered, we're off. We first get behind the wheel of the 2.0-litre TSI 4Motion with 180PS on offer and a 7-speed DSG 'box on hand. As long as we're on the road, everything is perfectly fine with the Normal mode even tackling the substantial amount of snow on the main road that leads north from Arvidsjaur. But as we turn off the beaten path, onto a snow covered bylane, switching to Snow mode makes the car feel even more planted. In fact, it's so planted, it takes us all the way up a steep incline to a viewpoint that overlooks the land of frozen lakes as surefooted as an ibex. An ibex shod with very steady 19-inch wheels, no less. The fact that the car's also shed 50kg compared to its previous iteration probably helps, although the real workhorse here is the fifth-generation Haldex system, which sends power primarily to the front wheels, but to the rear axle too in case you manage to lose traction. The 2.0-litre TDI SCR 4Motion, with 150PS on tap, also mated to a 7-speed DSG auto 'box also proved as fleet footed as it's not-so-sticky sister, although not as quiet inside the cabin. While we didn't really get to try out the off-road capabilities of the Tiguan in earnest, we did get to have a bit of fun with the driving aids switched off. The TSI, given that it had 30PS more on offer than the TDI version, was easier to drift, and hence won us over in terms of grin factor. But, step on the gas a little more in the diesel, and it certainly does slide around corners like you want it to. While the petrol engine is certainly smoother, both cars proved to be precise handlers, with the well-weighted steering wheel responding very quickly and very well to any inputs we made. While we drove just the two models that Volkswagen had made available to us, there are more engine and gearbox combinations on offer when the Tiguan goes on sale in April 2016. Two 1.4-litre petrol motors will be available, with 125PS and 150PS on offer, while a range-topping 2.0-litre 220PS petrol will also go on sale. The 2.0-litre diesels will range from a 115PS variant, to a 190PS and a 240PS version as well. 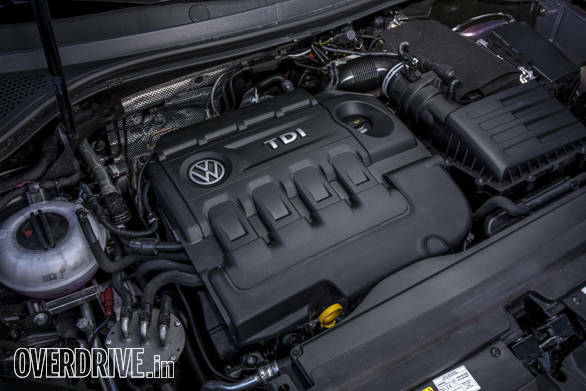 And while all the petrol engines are mated to a 7-speed DSG, one that Volkswagen says they've made quicker and more responsive, the base diesels will be available with a 6-speed manual gearbox. Depending on the engine variant that you decide to opt for, the Tiguan either has the 4Motion AWD system available as an option, or standard. The least powerful engine variants come with front-wheel drive. 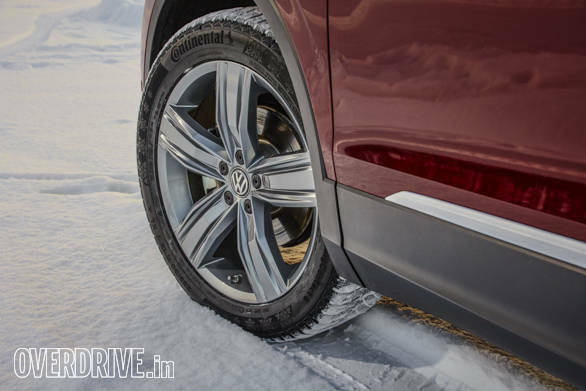 And, it's interesting to note that all the AWD versions of the Tiguan have a higher ground clearance by 11mm over the front-wheel drive cars (expect this variant to make it to India). The Tiguan is fully specced in terms of driving assistance systems too. All cars come equipped with lane assist, front collision warning and autonomous city braking which detects impacts with cars and pedestrians. It also features a post-collision braking system, which slows the car down in the unfortunate event of an accident, and has an active bonnet that works towards reducing the impact of a collision. Let's not forget that the cars also have seven airbags. 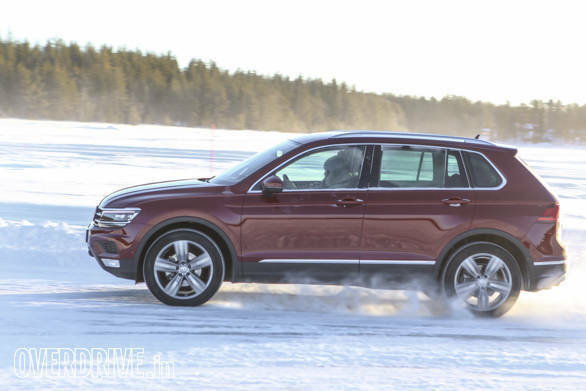 The Tiguan is the car that Volkswagen, post emissions scandal, are banking their hopes on. With 2.6 million first-gen Tiguans sold worldwide, they're probably right in thinking that the second-generation car might well be the sharpest knife in the VW box. And since capturing the SUV market is their goal, with the company aiming to put four new SUVs on sale by the end of the decade, the Tiguan really does appear to be a good start. 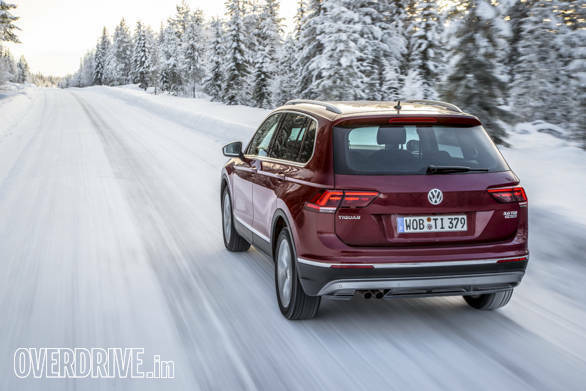 For all intents and purposes, it would appear that the Tiguan could have the desired impact on the Indian market  even taking on rivals like the BMW X1 and Audi Q3 that might have been a class above earlier. Which means, on the face of it, VW have got things right. Fine facial character lines and all. For India though, there's the little matter of the price tag to be considered.